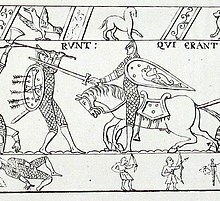 In medieval Scandinavia, husmän (Old Norse: húskarlar, singular húskarl; also anglicised as housecarl huscarl (Old English form) and sometimes spelled huscarle or houscarl) were either non-servile manservants or household troops in personal service of someone, equivalent to a bodyguard to Scandinavian lords and kings. This institution also existed in Anglo-Saxon England after its conquest by the kingdom of Denmark in the 11th century. In England, the royal housecarls had a number of roles, both military and administrative; they are well known for having fought under Harold Godwinson at the Battle of Hastings. The original Old Norse term, húskarl, literally means "house man"; see also the Anglo-Saxon term churl or ceorl, whose root is the same as the Old Norse karl, and which also means "a man, a non-servile peasant". These were well trained men who were paid as they were full-time soldiers. The Anglo-Saxon Chronicle uses hiredmenn as a term for all paid warriors and thus is applied to housecarl, but it also refers to butsecarls[a] and lithsmen. It is not clear whether these were types of housecarl or different altogether. The runestone U 335 at Orkesta commemorates the housecarl of a local lord. Originally, the Old Norse word húskarl (plural: húskarlar) (spelled huskarl, pl. huskarlar in Swedish) had a general sense of "manservant", as opposed to the húsbóndi, the "master of the house". In that sense, the word had several synonyms: griðmenn ("home-men") in Norway and Iceland, innæsmæn ("inside-men") in Denmark. Housecarls were free men, not to be confused with thralls (slaves or serfs); to this effect, the Icelandic laws also calls them einhleypingar ("lone-runners") and lausamenn ("men not tied"). Both terms emphasise that they were voluntarily in service of another, as opposed to thralls. Ketill and Bjôrn, they raised this stone in memory of Þorsteinn, their father; Ônundr in memory of his brother and the housecarls in memory of the just(?) (and) Ketiley in memory of her husbandman. These brothers were the best of men in the land and abroad in the retinue [lid], held their housecarls well. He fell in battle in the east in Garðar (Russia), commander of the retinue [lid], the best of landholders. According to Omeljan Pritsak, this Þorsteinn may have commanded the retinue of king Yaroslav I the Wise. Thus, the housecarls mentioned here would be royal bodyguards ; in any case, it can be seen here that the word "housecarl" now applied to someone who fought in the service of someone. In Norway, housecarls were members of the king's or another powerful man's hirð. The institution of the hirð in Norway can be traced back to the 9th century. The texts dealing with royal power in medieval Norway, the Heimskringla and the Konungs skuggsjá ("King's Mirror"), make explicit the link between a king or leader and his retainers (housecarls and hirðmenn). There was a special fine for the killing of a king's man, which in Konungs skuggsjá is underlined as an advantage of entering the king's service. Conversely, retainers were expected to avenge their leader if he was killed. Sigvatr Þórðarson (also known as Sigvat the Skald), a court poet to two kings of Norway, Olaf II of Norway (saint Olaf) and Magnus the Good (and also to two kings of Denmark), called the retainers of Olaf II of Norway heiðþegar, meaning "gift- (or pay-)receivers". More precisely, Snorri Sturluson explained that "heið-money is the name of the wages or gift which chieftains give". Thus, Sigvat probably referred to an institution similar to the Danish heimþegar (see below) or to the housecarls of Cnut the Great (see below): free men in the service of a king or lord, who gave them gifts as payment of said service. It is known from Icelandic sources that in the 1060s, the royal housecarls were paid with Norwegian coins. 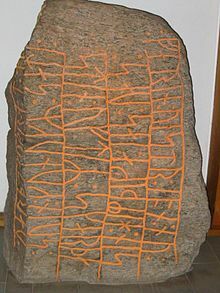 The Skarthi Stone (DR 3), one of the Hedeby stones, "placed by king Sveinn in memory of Skarði, his retainer [heimþega]"
Six runestones in Denmark, DR 1, DR 3, DR 154, DR 155, DR 296, and DR 297, use the term heimþegi (pl. heimþegar), meaning "home-receiver" (i.e. one who is given a house by another). The use of the term in the inscriptions suggest a strong similarity between heimþegar and housecarls: like housecarls, heimþegar are in the service of a king or lord, of whom they receive gifts (here, homes) for their service. Johannes Brøndsted interpreted heimþegi as nothing more than a local (Danish) variant of húskarl. Thurlf, Sven's retainer [heimþegi, a variant of húskarl according to Brøndsted] erected this stone after Erik his fellow, who died when the warriors sat around [i.e. besieged Hedeby, but he was a commander, a very brave warrior. King Sveinn placed the stone in memory of Skarði, his retainer [himþiga or heimþegi, again a variant of húskarl], Skarde, who has sailed in the west [a possible reference to a campaign in England], but who then died at Hedeby. Under Svein Forkbeard and Cnut the Great, when the Danish kings came to rule England, a body of royal housecarls was developed there, with institutions that were partly of Norse inspiration, and partly inspired by canon law (see below). But even after the Danish kings had lost England, housecarls continued to exist in Denmark. Such a group of royal retainers was still in place at the beginning of the 12th century, under Niels of Denmark, when, according to Danish historian Svend Aggesen, Aggesen's grandfather, a member of the retinue, was tried for the murder of a fellow housecarl. Svend Aggesen's account of the law governing Cnut the Great's housecarls in 11th century England (the Witherlogh or Lex Castrensis) may reflect, in fact, those governing Danish housecarls in the 12th century. But, by the end of the 12th century, housecarls had probably disappeared in Denmark; they had transformed into a new kind of nobility, whose members no longer resided at the king's court. The term entered the English language when Svein Forkbeard and Cnut the Great conquered and occupied Anglo-Saxon England; the housecarls of Cnut were highly disciplined bodyguards. It is unclear, however, whether Cnut's housecarls were all Scandinavians; according to Susan Reynolds, it is likely that some of them were, or became, or were thought of as English. Housecarls were only one group of paid mercenaries or hiredmenn who fought for England before the Norman Conquest. From the annals, it is not clear whether other paid men were types of housecarl or simply just a subdivision. There were groups known as lithsmen[b] and butsecarls, who were mercenaries that were equally adept in land and maritime warfare. Also, there were bands of foreign warriors under the control of foreign commanders, who served not just as a standing army for the king but also as the retinues of important Anglo-Saxon lords. For example, one version of the Anglo-Saxon Chronicle refers to Earl Tostig's retainers as hiredmenn whereas another version calls them hus karlas. As Tostig was fighting against the king at the time, then the use of the term housecarl seems to have been a synonym for a mercenary or retainer rather than just royal bodyguards. It also would have been used to differentiate between that of the paid warrior and the unpaid militia known as the fyrd. 1904 representation of Cnut with his courtiers. According to 12th century Danish historian Svend Aggesen, Cnut's housecarls were governed by a specific law, the Witherlogh or Lex Castrensis. Their organisation in a band or guild was Scandinavian in character, but the legal process the Witherlogh defines is mainly derived from canon law, directly or through Anglo-Saxon laws. Other possible inspirations include the rules of the Jomsvikings and the rules of the Norwegian hirð. The Whitherlogh defined an etiquette: housecarles were to be seated at the kings' tables according to a number of factors, among which skill in war and nobility. They could be disgraced by being moved to a lower place; this was punishment for minor offences, such as not giving proper care to the horse of a fellow housecarl. After three such offences, the offender could be seated at the lowest place, and no-one was to talk to him, but everyone could throw bones at him at will. The murder of another housecarl was punished by outlawry and exile, whereas treason was punished by death and confiscation of all property. Quarrels between housecarles were decided by a specific tribunal (gemot), the Huskarlesteffne, in the presence of the king; depending on the nature of the quarrel, a varying number of testimonies would be required. However, the Witherlogh as we know it through Svend Aggesen was redacted more than one century after the time of Cnut; thus, we cannot be sure that it presents an accurate picture of Cnut's housecarls. A coin from the reign of Cnut, such as may have been used to pay Cnut's housecarls. A special tax was levied to provide pay in coin to the royal housecarls. According to Saxo Grammaticus, the pay was monthly. Due to these wages, the housecarls can be seen as a type of mercenary; the Knýtlinga saga calls them málamenn ("men receiving wages"), while Florence of Worcester uses the term solidarii ("salarymen") and William of Malmesbury that of stipendarii ("paid men"). Furthermore, the housecarles were not bound to indefinite service; but there was only one day in the year during which they could leave the king's service. That was New Year's Eve, a day on which it was customary for Scandinavian kings to reward their retainers with gifts. On one hand, the number of housecarls receiving land grants and estates from the king seems to have been rather limited, from the beginning of Cnut's reign up to the Norman conquest in 1066. At that last date, the Domesday Book records only thirty-three landholding housecarls in the kingdom; furthermore, these estates were small. Thus, it does not seem that the English landholders were deprived of their properties to provide for land grants to the king's housecarls. On the other hand, some of Cnut's housecarls seem to have been quite prosperous; the Abbotsbury Abbey was founded either by one of them under the reign of Cnut himself, or by his wife under the reign of Edward the Confessor. The royal housecarls had some administrative duties in peacetime as the King's representatives. Florence of Worcester recounts how, in 1041, there was a revolt against a very heavy levy in Worcester, and two of king Harthacnut's housecarls, who were acting as tax collectors, were killed. Because the main sources on Cnut's housecarls were written at least one century after Cnut's reign, there are several theories about the exact nature and role of these housecarls. Cnut is said to have retained 3,000 to 4,000 men with him in England, to serve as his bodyguard. One theory is that these men were Cnut's housecarls, and that they served as a well-equipped, disciplined, professional, and quite numerous (for the time) standing army at the service of the king. However, another theory is that there was nothing like an important, standing, royal army in 11th century Anglo-Saxon England. This debate has direct consequences on the assessment of the housecarls' specificities, and whether or not they were an elite troop. For instance, Charles Oman, in his book The Art of War in the Middle Ages (1885), states that the main advantage of the housecarls at Hastings were their esprit de corps. This view, still widely held today, mainly stems from Svend Aggesen's 12th-century description of Cnut's housecarls as a group characterized by a strict code (see above); Aggesen having been used as a main source by L.M. Larson's The King's Household in England Before the Norman Conquest (1902). 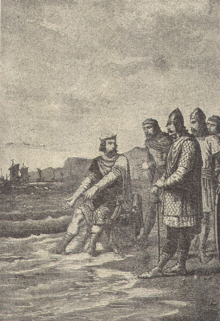 However, more recently, historian Nicholas Hooper criticised Larson and stated that "it is time to debunk the housecarl"; according to Hooper, housecarls were not in effect distinguishable from Saxon thegns, and were mainly retainers who received lands or pay (or both), but without being really a standing army. Hooper asserts that while the Housecarles might well have had superior esprit de corps and more uniform training and equipment than the average Thegn, they would not necessarily have been a clearly defined military elite. Yet another theory is that the role of a standing army was not assumed, or was not mostly assumed, by the royal housecarls; but that the housecarls were a smaller body of household troops, partly stationed at the king's court. During the reign of Edward the Confessor, a number of sailors and soldiers, the lithsmen[b], were paid wages and possibly based in London; those lithsmen[b] were, according to some, the main standing armed force, while the housecarls were only acting as a secondary one. One reason to doubt the existence of a standing army made of housecarls is that, when there was a revolt in 1051, under the reign of Edward the Confessor, no such standing army was used to crush it, whereas its existence would have allowed for a swift, decisive action against the rebels. By the end of the 11th century in England, there may have been as many as 3,000 royal housecarls (the Þingalið). As the household troops of Harold Godwinson, the housecarls had a crucial role as the backbone of Harold's army at Hastings. Although they were numerically the smaller part of Harold's army, their possibly superior equipment and training meant they could have been used to strengthen the militia, or fyrd, which made up most of Harold's troops. The housecarls were positioned in the centre, around their leader's standard, but also probably in the first ranks of both flanks, with the fyrdmen behind them. In the Battle of Hastings, these Housecarls fought after Harold's death, holding their oath to him until the very last man was killed. The Bayeux Tapestry depicts the housecarls as footmen clad in mail, with conical nasal helmets, and fighting with the great, two-handed Dane axe. ^ Butsecarl is a term that has been translated to mean 'sailor' and 'warrior' but is very likely a combination of the two. ^ a b c The name lithsmen or lið is an ambiguous term which is thought to mean 'sailor' in Anglo-Saxon, but seems to mean 'warrior' in the Norse literature. However they were undoubtedly some form of standing mercenary force. ^ "Germanic Lexicon Project". web.ff.cuni.cz. Retrieved 16 March 2010. ^ a b c d Hollister, C. Warren (1962). Anglo-Saxon Military Institutions on the Eve of the Norman Conquest. Oxford: Clarendon Press. pp. 16–18. ^ Cleasby, Richard; Vigfússon, Guðbrandur (1874). Cleasby-Vigfusson Old Icelandic Dictionary. lexicon.ff.cuni.cz: Clarendon Press, Oxford. Retrieved 16 March 2010. ^ a b c Foote, Peter; Wilson, David M. (1970). "3, "The Free"". The Viking Achievement. London: Book Club Associates. ^ a b Central Committee, British Archaeological Association; Central Committee, Archaeological Institute of Great Britain Ireland; Council, Royal Archaeological Institute of Great Britain Ireland; Ireland, Royal Archaeological Institute of Great Britain and; Britain), Royal Archaeological Institute (Great (1866). The Archeological Journal. 23. London. ^ a b c d e f g h Brøndsted, Johannes (1960). The Vikings. Harmondsworth: Penguin. ^ Entry Sö 338 in Rundata 2.0 for Windows. ^ a b c d e f g Larson, Laurence Marcellus (1902). The King's Household in England Before the Norman Conquest. Bulletin of the University of Wisconsin. 100. Madison: University of Wisconsin. ^ Bagge, Sverre (1991). Society and Politics in Snorri Sturluson's Heimskringla. Berkeley: University of California Press. ^ a b c Jesch, Judith (2001). Ships and Men in the Late Viking Age: The Vocabulary of Runic Inscriptions and Skaldic Verse. Woodbridge: The Boydell Press. ISBN 0-85115-826-9. ^ Andrén, Anders (1989). "State and Towns in the Middle Ages: The Scandinavian Experience". Theory and Society. New York, Heidelberg, Dordrecht: Springer. 18 (5): 585–609. doi:10.1007/BF00149493. JSTOR 657612. ^ Sprague, Martina (2007). Norse Warfare: the Unconventional Battle Strategies of the Ancient Vikings. New York: Hippocrene Books. p. 54. ISBN 0-7818-1176-7. ^ Project Samnordisk Runtextdatabas Svensk Rundata. ^ Reynolds, Susan (1985). What Do We Mean by "Anglo-Saxon" and "Anglo-Saxons"?. The Journal of British Studies. 24. Chicago: University of Chicago Press. JSTOR 175473. ^ a b c d Wise, Terence (1979). Saxon, Viking and Norman. Osprey. ISBN 978-0-85045-301-0. ^ Brown, Reginald Allen, ed. (1985). Proceedings of the Battle Conference, 1984. Anglo-Norman studies. VII. Bury St Edmonds: St Edmundsbury Press. ISBN 978-0-85115-416-9. ^ Ward, Grace Faulkner (1954). The English Danegeld and the Russian Dan. American Slavic and East European Review. 13. Cambridge, MA: The American Association for the Advancement of Slavic Studies. JSTOR 2491815. ^ Mack, Katharin (1984). "Changing Thegns: Cnut's Conquest and the English Aristocracy". Albion: A Quarterly Journal Concerned with British Studies. Chicago: University of Chicago Press, The North American Conference on British Studies. 16 (4): 375–387. doi:10.2307/4049386. JSTOR 4049386. ^ Darlington, R. R. (1936). "Ecclesiastical Reform in the Late Old English Period". The English Historical Review. Oxford: Oxford University Press. 51 (203): 385–428. doi:10.1093/ehr/LI.CCIII.385. JSTOR 553127. ^ Gillingham, John (1990). "Chronicles and Coins as Evidence for Levels of Tribute and Taxation in Late Tenth- and Early Eleventh-Century England". The English Historical Review. Oxford: Oxford University Press. 105 (417): 939–950. doi:10.1093/ehr/CV.CCCCXVII.939. JSTOR 574620. ^ a b Gravett, Christopher (1992). Hastings 1066: the fall of Saxon England. Wellingborough (UK), Osceola (WI): Osprey Publishing. ISBN 978-1-84176-133-6. ^ Oman, Charles (1885). The Art of War in the Middle Ages. Cornell University Press. ISBN 978-0-8014-9062-0. ^ Hooper, Nicholas (1992). "The Housecarls in England in the 11th Century". In Strickland, Matthews. Anglo-Norman warfare: studies in late Anglo-Saxon and Anglo-Norman military organization and warfare. Woodbridge: Boydell & Brewer. ISBN 978-0-85115-328-5. ^ Lavelle, Ryan (2010). Alfred's Wars Sources and Interpretations of Anglo-Saxon Warfare in the Viking Age. Woodbridge, Suffolk: Boydel Press. p. 155. ISBN 978-1-84383-569-1. ^ a b Sayers, William (2003). "Ships and Sailors in Geiffrei Gaimar's "Estoire des Engleis"". The Modern Language Review. London: Modern Humanities Research Association. 98 (2): 299–310. doi:10.2307/3737812. JSTOR 3737812. ^ Morillo, Stephen (1996). The Battle of Hastings: sources and interpretations. Woodbridge: The Boydell Press. ISBN 978-0-85115-619-4. ^ Purser, Toby (2004). Medieval England 1042-1228. Oxford: Heinemann Educational Publishers. ISBN 978-0-435-32760-6. Abels, Richard P. (2008). "Household Men, Mercenaries and Vikings in Anglo-Saxon England". In J. France. Mercenaries and Paid Men: The Mercenary Identity in the Middle Ages. Leiden: Brill. pp. 143–66. ISBN 978-90-04-16447-5. Hooper, Nicholas (1985). "The Housecarls in England in the Eleventh Century". Anglo-Norman Studies. 7: 161–76. Reprinted as: Hooper, Nicholas (1992). "The Housecarls in England in the Eleventh Century". In Matthew Strickland. Anglo-Norman Warfare: Studies in Late Anglo-Saxon and Anglo-Norman Military Organization and Warfare. Woodbridge: Boydell & Brewer. pp. 1–16. ISBN 978-0-85115-328-5. Hooper, Nicholas (1994). "Military Developments in the Reign of Cnut". In Alexander R. Rumble. The Reign of Cnut: King of England, Denmark and Norway. Studies in the Early History of Britain. London: Leicester University Press. pp. 89–100. This page was last edited on 9 March 2019, at 01:38 (UTC).